Even though our zone has diminished in physical size, the spirit is still very strong. If all goes well next transfer (next week), we should be up two more Elders. It will be interesting to see what happens. 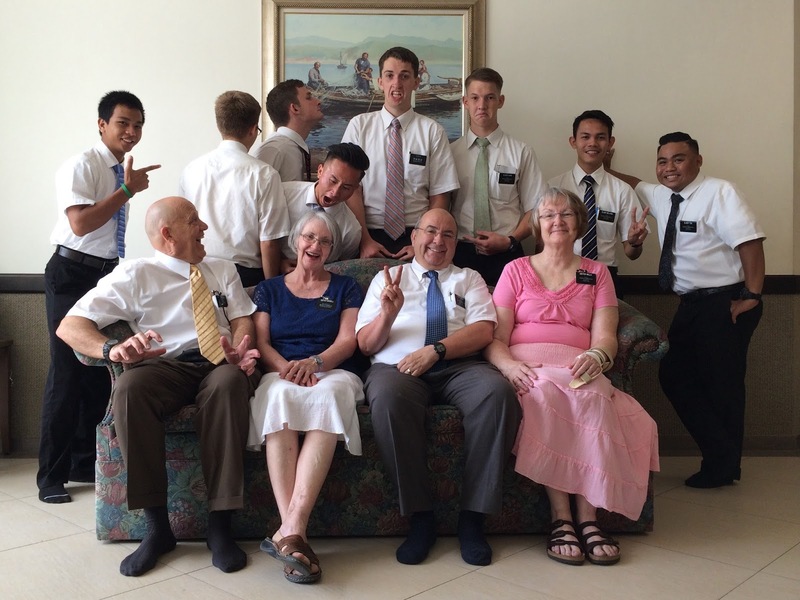 Who says you can't have a little fun as a missionary? I had the opportunity to go on exchanges Wednesday with Elder S. The rest of this week is pretty hectic so he and Elder Y needed some extra help. We got a lot accomplished. Elder S has been reading the Book of Mormon aloud (and recording) as part of his language study. I've taken those recordings and started a collection to created a CD of Kitab Mormon to give to those investigators and members who can't read. I started this a few missionaries ago. We have a plan to also involve the seminary students here. We have already made a couple of CDs with what we have, and the recipients have been very grateful. Elder S and I were also able to visit a couple of investigators and teach a lesson. One of the investigators is being baptized this week. More about that later. It was great to share in the teaching, whether in my stilted Malay or translated by Elder S. It was a blessing to be with him. He has a quiet way about him that readily brings the Spirit into homes. The upcoming baptism is a combined Chinese/Malay speaking service. We ended up with the Chinese Elders joining Elder S and Sister Bodell and me to work up the programs for the baptismal service which is Friday night. That was interesting. We had each program on a separate computer. 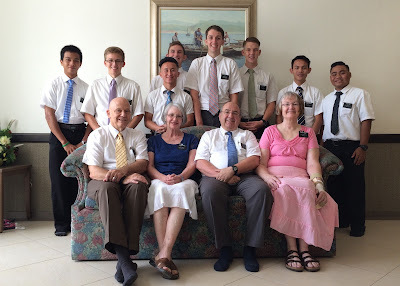 Elder S made the comment that it reminded him of the old monks translating the Bible. Good point! The only differences are these are young guys, no monk robes, and they've got computers to use. Can you picture these three in brown cloaks hovering over their computers translating the Bible? Elders S, E, and S translating the baptismal program into Chinese and Malay. I feel like the week has gone by really fast, and I'm not quite sure how much we got done. The mission president and his wife were here Wednesday for interviews with the Elders and also Temple and Patriarchal Blessing interviews. It was like a comedy of errors trying to get that organized and people scheduled for interviews. It's not that we did much to help, just overseeing that it could all get done. The Elders managed to pull it off. Those who could be interviewed, were interviewed. The president will have to come back after the Temple Prep class and interview several more so they can, hopefully, go to the Temple in December. Friday we helped the district move the two Sibu Jaya Elders to their new home. It's quite a nice place and definitely cleaner than the previous. We had six Elders, one and half senior couples, and two youth, Rolyn and Ostine, from Sibu Jaya who helped. Sister Bodell and I completed the house inventory so everyone knows what belongs to the Church and what belongs to the landlord/owner. It's a good thing this is not what it looks like. Just one, large, heavy wardrobe. I liked the picture, but the lighting was bad! We finished and got back to Sibu about 5:30 PM. That gave us time to get home, have some dinner, and get the programs printed for the baptism that night. The baptismal service was wonderful. There were two Chinese girls baptized and a young Malay woman. President Chua Hut, the Chinese Branch president conducted the meeting in Chinese and Malay. That was amazing! His daughter, Mimi, translated the other talks from Malay to Chinese and from Chinese to Malay. It was an international baptism! There haven't been any Chinese baptisms for quite sometime so it was exciting to have these two young girls baptized. Their mom is already a member. Hopefully it won't be too long before their father joins them. Where's Boyd when I need him? I was sustained and set apart on Sunday as an assistant branch clerk in Branch 1. I will be helping Brother Juan with everything from membership to finance. The first thing I did was print out a list of eligible seminary and institute students. Brother Juan and I went through the list to see who's who. There are several who are married, moved, or for whom there is no information available. We have a lot of contacting to do to bring the lists up to date. Another first occurred Sunday evening. Something I've been contemplating for awhile is creating a seminary council for the Sibu District. We had our first council meeting this evening. The good news is that the meeting went well; the district president called a president for the council, Rolyn, who accepted the calling. (He will do an excellent job!) The bad news is that we had four of the eight seminary students selected to be on the there. Of the other four, three haven't been called by the district president yet. The other has been called. He said he would be there, but he didn't come. Purpose of our Seminary Council is to 1. Plan activities, 2. Help activate youth, 3. Help conversion to Gospel of Jesus Christ, 4. Prepare to serve a mission, and 5. Help organize Youth Conference. The time is right to start this council now. It will be a positive influence, not only in the lives of those who are on the council, but also in the lives of all the seminary students in the Sibu District. We are excited to move forward. The council has scheduled their next meeting for next Saturday. One of the projects that we talked about this evening is having the seminary students record their reading of chapters in the Book of Mormon. We will burn these recordings to CD. We have several members and investigators that can't read. Thin the youth who participate. It will be an amazing service project! "But," you ask, "aren't there already recordings of the Book of Mormon?" The answer is yes, but not in Malay! This will be a great help to them. It will also help build stronger testimonies of the Book of Mormon in the youth who participate. It will be an amazing service project! I will keep you apprised of the progress of this project. Next week will prove interesting. We should be getting two new Elders and a new zone leader. We'll find out on Monday. Sister Bodell and I will also be doing some S&I teacher training during the week while traveling outside of Sibu. There should be a goodly amount to report next week. Until then, remember to read the Book of Mormon each day. You will be surprised by what you learn. It is the Word of God. You will be blessed by reading it! Trust me. I know.